The Squash, Anthea Hamilton’s vast, immersive new installation that occupies Tate Britain’s formidable Duveen Galleries, was seeded from something far smaller: a single photograph. 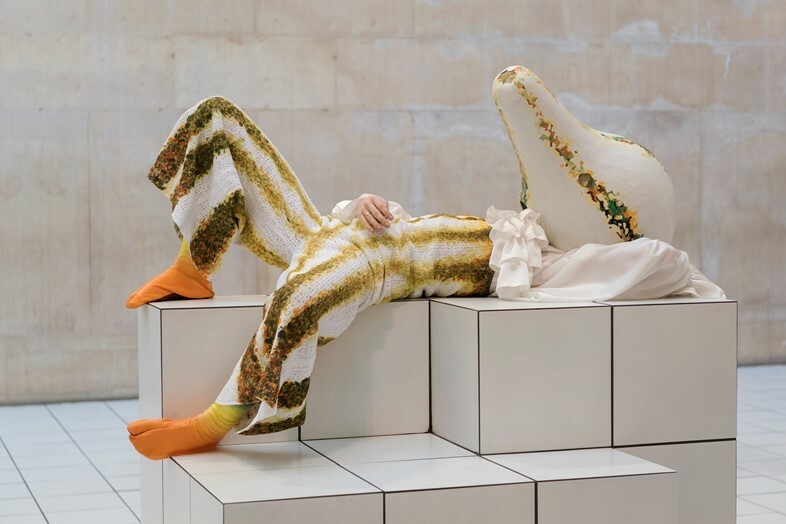 Now lost, it is her memory of the harlequin performer it depicts, reclined languorously among vines with a gourd for a head, that set the 2016 Turner Prize nominee’s expansive new work in motion. 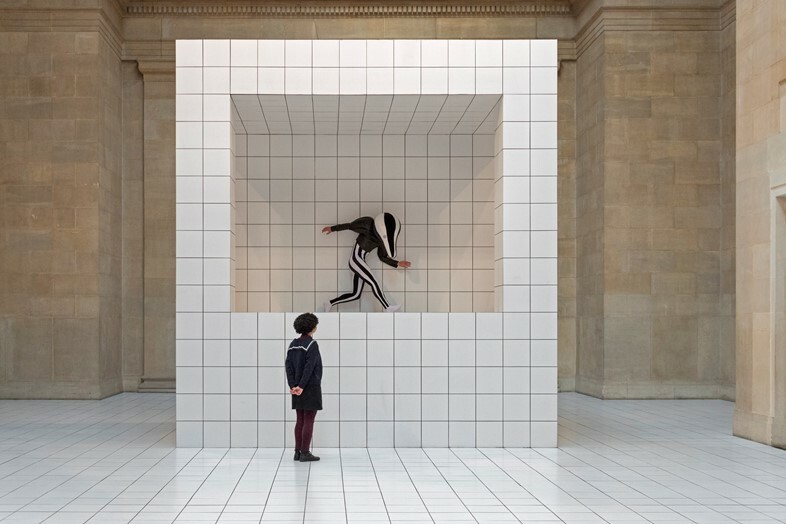 Here, in the gallery’s grand neoclassical hall, transformed by Hamilton with 7,000 white tiles – recalling at once the sterilised surfaces of a bathhouse, or municipal swimming pool, and a computer-generated grid – attendees will find that photograph, brought to life. For each day for the six-month residency a single, rotating performer will be transformed into one of Hamilton’s decorous, pumpkin-headed creatures and left to inhabit a space the artist calls their “garden”. 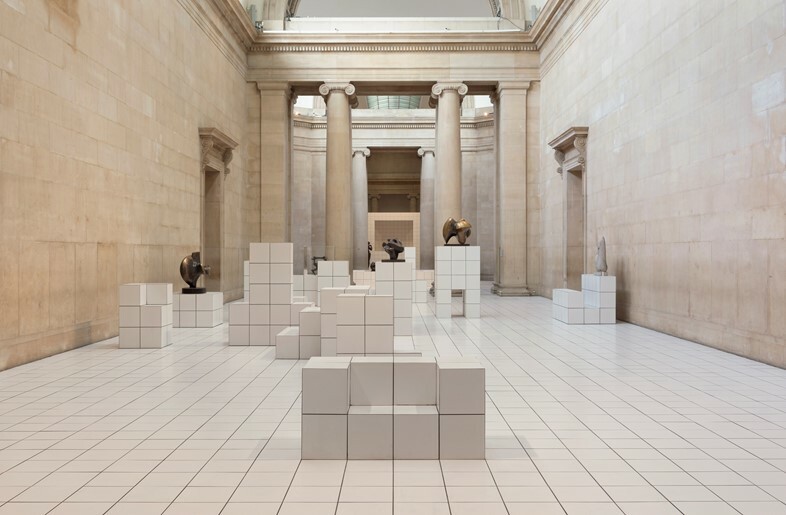 That space is also populated with a gathering of sculptures, spanning the 19th and 20th centuries, that Hamilton has selected from the Tate’s permanent collections. In keeping with the immersiveness of the project, the artist chose these objects not just for their aesthetic value – “vision is least important of the senses here,” she told British Vogue – but the way they might feel to the touch. The performers will interact with these works as well as the viewer, and each day they will select one of seven costumes from a rail to reflect their mood. Responsible for those is designer Jonathan Anderson of Loewe, the Spanish fashion house which has collaborated with Hamilton on the installation. The costumes are suitably surreal: black and white harlequin-striped trousers are matched with a monochrome squash headpiece and leather jacket, exaggerated at the shoulder to evoke a Tudor-era blouson; another body suit, worn with a billowing, ruffled shirt, is printed with markings that recall the skin of a marrow. One particularly striking green gourd is matched with trails of tonal ruffles that follow the performer, like tendrils of seaweed. The designer and artist – the latter of whom gained notoriety for her 2016 Turner Prize submission, a ten metre-high rendering of a man’s backside, in the midst of being pulled apart by two hands and inspired by a Gaetano Pesce drawing – first began working together in 2015. Anderson had commissioned Hamilton to create pieces for Loewe’s Chance Encounters exhibition at Art Basel Miami (one of those was Sauna Leg Chair, a hinged pair of lucite legs) and they have encountered and worked with each other several times since. Most recently, Hamilton provided the centre point of the designer’s S/S18 show for his eponymous label, JW Anderson: a hand-woven grass mat that sat in the middle of concentric circles of attendees. Tate Britain Commission 2018: Anthea Hamilton is on at Tate Britain, London until October 7, 2018.